How Safe Are Essential Oils for Dogs? Just a few days ago, news broke out that a 10-year-old girl caught a gruesome foot infection because of sand fleas in a rural part of Brazil. Now, this reminds us not to take for granted the tiny bloodsuckers lurking outside our homes, as they pose a huge threat to our family and pets. Remember, there are at least 2,000 species of fleas and we never know what dangers lie ahead when we aren’t careful. Too often, fur parents shell out an enormous sum for chemical solutions that expose both their human and furry family members to undesirable long-term consequences. Little do they know they can protect their family from fleas by using essential oils. Essential oils are volatile compounds extracted from plant material such as bark, flowers, seeds, and roots. If you’ve used one before, you already know how beneficial these aromatic oils are to your health and believe me, they have many uses beyond masking dog farts! The following are just a few of the many reasons why many pet owners are switching to essential oils. Fur parents are using essential oils because they contain antiseptic, anti-inflammatory, and analgesic properties. Dr. Janet Roark, the proud owner of Hill Country Mobile Veterinary Service in Texas is one of the many veterinarians who embrace the use of essential oils. There are many ways to use essential oils as a flea repellent. Combined with other ingredients, you can create a topical anti-flea spray, powder, shampoo, and the list goes on. Although flea pills, collars, baths, powders, and spot-on treatments are a good way to kill and repel fleas, prolonged use can sometimes lead to adverse side effects in our pets such as allergies, chemical burns, lethargy, nausea, and even respiratory problems. Essential oils, on the other hand, are natural and hence, you won’t have to worry about harmful consequences. A child can be exposed to pesticides when he plays with a pet that is wearing a flea collar. The active ingredients are easily absorbed through the skin and can be accidentally ingested. Repeated exposure to chemicals can also be harmful to adults with sensitivities or poor immune function. That is why many families are relying on essential oils for protection as they are safe, reliable, and affordable to boot. It’s no secret that holistic vets use essential oils in their practices. For that, more pet owners have come to the realization that these potent oils have profound effects on their canine companions. Whether an essential oil is safe or not, the answer boils down to its administration. Some essential oils are relatively safe when applied topically but are potentially dangerous when ingested. Additionally, there are certain essential oils that aren’t recommended at all for dogs or animals in general. It is best to speak with your veterinarian so he can update you with the list of essential oils you can safely use for your canine companion. 2. Have your dog wear a cone to prevent ingesting certain essential oils, as they might cause gastrointestinal distress to your pet. 3. It is particularly harmful to use essential oils in excessive amounts. Be sure to observe moderation. 4. Ask your veterinarian what possible side effects a particular essential oil can cause a sensitive pet. Peppermint essential oil is famed as one of the best natural solutions for fighting off fleas in dogs. In fact, it is a widely used active ingredient in commercial shampoos, soaps, and collars. Not only does it repel fleas, but peppermint essential oil also kills pre-existing fleas and breaks the flea life cycle. Adding a few drops of peppermint oil to your dog’s regular shampoo is also a great way to get rid of those pesky freeloaders living off your canine buddy. Sprinkling or spraying peppermint essential oil around your home, particularly in areas where you suspect has fleas, is also ideal. Additionally, you may rub undiluted peppermint essential oil on a flea bite to help relieve pain and promote healing. However, you should never use this oil on a pup or a toy dog because a tiny amount is irritating enough for small animals and even toxic when ingested. 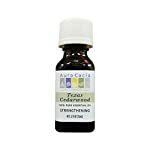 Peppermint Essential Oil 10 ml (0.33 fl. Oz.) - GCMS Tested, 100% Pure and ..
Thyme oil features antibacterial and anti-inflammatory abilities that help shield your pooch from secondary infections associated with flea bites. It also acts as a fungicide when applied topically on your dog. Since thyme essential oil is highly potent, you should always mix it with a carrier oil. Otherwise, undiluted essential oil could do more harm than good to your pet. 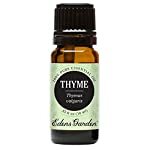 Edens Garden Thyme Essential Oil, 100% Pure Therapeutic Grade (Highest Qual..
Cedarwood is another essential oil that requires you to be very conservative. Just a few drops of this oil are enough to eliminate annoying parasites from flea-infested areas. You can also add cedarwood essential oil to a home diffuser to cleanse the air you breathe. Aside from being an amazing natural flea repellent, it is also an antiseptic for the lungs and an expectorant for coughs. Likewise, it helps reduce anxiety and nervous aggression in dogs when used for aromatherapy. Take note that not all cedarwood essential oils are pet-friendly. Unless it is sourced from Eastern Red Cedar or Texas Red Cedar, it could pose hazards in dogs. Most importantly, don’t forget to mix cedarwood essential oil with a carrier oil should you wish to use it for topical applications. Pennyroyal, a plant from the mint family, is one of the oldest tried-and-true remedies for fleas. Up till now, pennyroyal is famed as an exemplary insect-repellent. Just a meager amount of pennyroyal essential oil is enough to put down a heavy infestation. Be careful though, as this oil can be highly irritating for your skin and even toxic when ingested by your dog. It should not be applied directly on your pet but rather, sprinkle a few drops to your dog’s bed and other areas that are frequently visited by your pet. There is more to lavender than its delightful summery scent. Lavender essential oil offers a practical alternative to chemical-based flea repellents, as it exhibits potent antiseptic and anti-inflammatory properties. Apply diluted lavender essential oil directly to your dog’s coat to stop fleas from snacking on your dog. Lavender essential oil also soothes itching, irritation, and inflammation caused by flea bites. Its antimicrobial action prevents infection, promotes healing, and minimizes scarring. Additionally, aromatherapy in the form of diffused lavender essential oil does a great job at calming anxious dogs, as well as reducing travel-induced excitement in dogs. 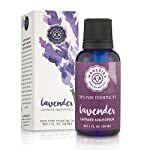 Woolzies Lavender Essential Oil – 100% Pure Therapeutic Grade Lavender Oi..
Add a few drops of rosemary essential oil to your dog’s bath water and final rinse. Rosemary essential oil has antiseptic properties and hence, your pooch comes out of the tub a lot fresher, cleaner, and free of fleas. However, make sure your cat is out of reach while your dog is drenched with the rosemary-infused bathwater because the oil is toxic for cats. USDA Certified Organic Rosemary Essential Oil. 15 ml cobalt blue bottle, 10.. The lemon essential oil has a rejuvenating scent that we love but fleas hate. Adding a few drops of lemon essential oil to your pooch’s shampoo, as well as sprinkling some to his bed can keep fleas at bay. But as with lavender essential oil, it only repels fleas. Nevertheless, it remains a popular choice among pet owners because it helps keep the house smelling fresh and clean. Similar to lemon, lemongrass essential oil emits a happiness-inducing fragrance that causes great depression on lurking fleas. Its invigorating scent may not kill fleas, but it is enough to drive them away. Given its amazing scent, one of the most popular uses for lemongrass essential oil is in a home diffuser but you can also use for topical purposes. Make sure to dilute the essential oil with a carrier oil or reduce its strength by adding it to another product such as dog shampoo. Dr. Judy Morgan, Essential Oils – Dangerous or Beneficial? Okaw Veterinary Clinic, Essential oils – Are they Safe for Pets?